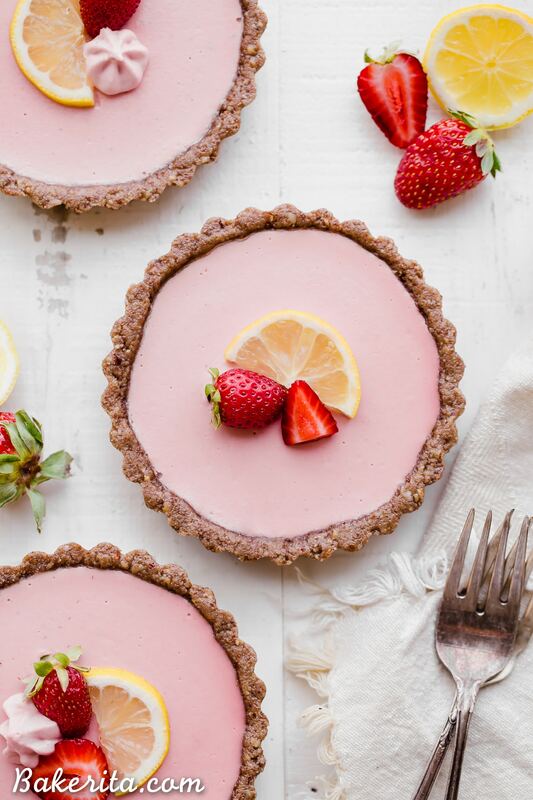 These No Bake Strawberry Lemonade Tarts have a raw “graham cracker” style crust filled with a super refreshing strawberry lemonade filling. These are SO good frozen on a hot day and they’re gluten-free, paleo and vegan. It’s been sweltering in San Diego. Probably not so hot compared to you folks in the southern US or Arizona or living down near the equator…but for me? A girl who prefers cooler, cloudy days with just a peek of sunshine? Well, I’ve been melting. I also get super sweaty (thanks, Dad), so sometimes when I’m on a walk with Hank and the sun is BEATING down with not a cloud in the sky (like today), I literally feel like I’m going to be a puddle on the floor in a moment or two. THANKFULLY, I have air conditioning or I’m not entirely sure I would be a functioning human. Even so, I don’t want to turn on the oven to bake…like, at alllll. So no-bake treats it is! They’re the true MVP of summer. 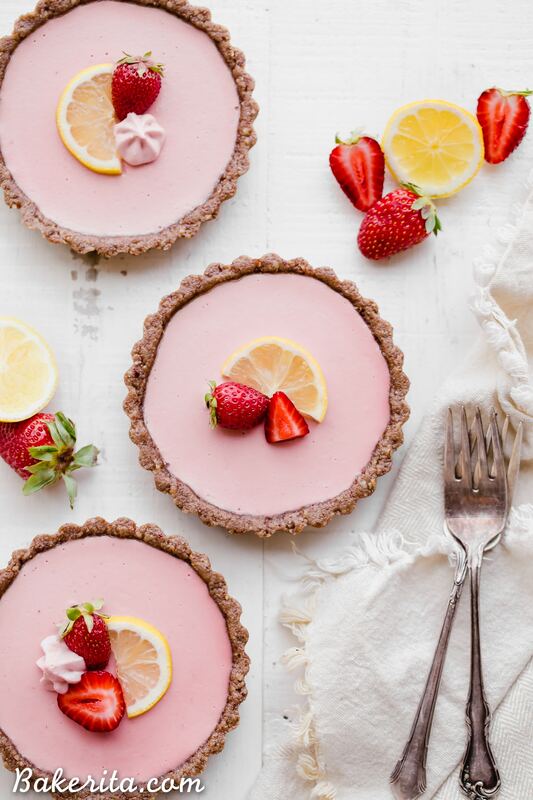 I’ve had the idea for a strawberry lemonade treat in my head for a while now and this weather brought it right to the top of mind – is there much that’s more refreshing than a frosty strawberry lemonade on a sweltering day? Don’t think so. 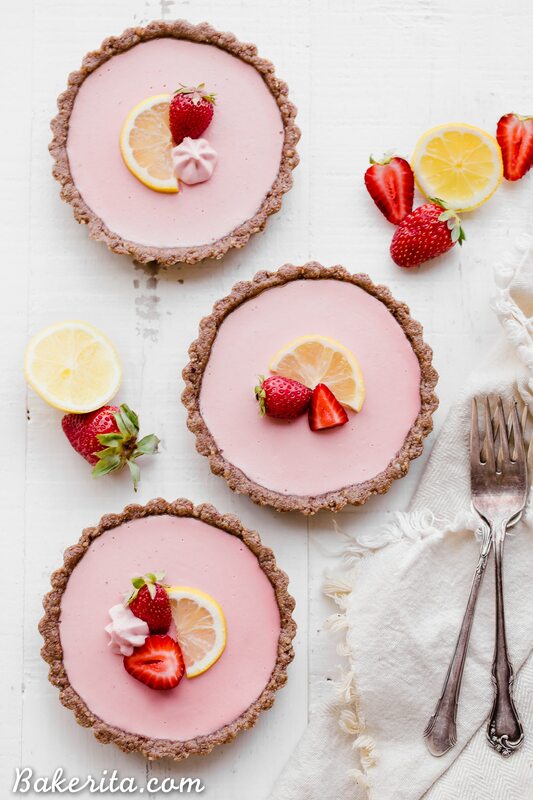 I used to love those soft frozen strawberry lemonade cups that you could get at the fair and wanted something kind of similar to that for the filling…but without all the sugar/crap in them. These are pretty close, but if you ask me, even more delicious because they’re encased in a scrumptious crust. At the 4th of July party I went to this year, the chef made a gluten-free/vegan cheesecake and when he brought me a slice during the fireworks show, my full attention went to my slice of cheesecake because it was insanely good. He had recreated a graham cracker crust so well that I had to go back and ask him what he put in it because I barely believed it was gluten-free. Turns out, pecans and coconut sugar together do wonders. I’m not sure mine is even as good as his crust was, but I gotta say, my version with almond flour, cinnamon, and coconut oil too, is so dang good and definitely tastes like a graham cracker crust. 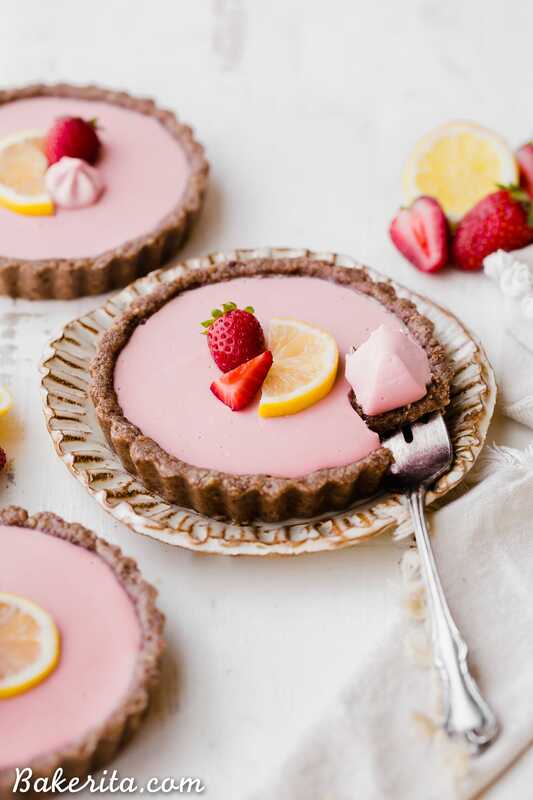 The strawberry lemonade filling has a cashew base, with lots of lemon juice + zest, coconut cream, cacao butter, maple syrup, a little salt, and fresh strawberries. Make sure you use fresh lemon juice and great strawberries. The darker and sweeter the strawberries, the better. I used just-picked strawberries I had just gotten at the farmers market and the result was a bright, bold strawberry flavor that tasted so, so fresh. Once these have firmed up in the freezer, you’re in for a TREAT. 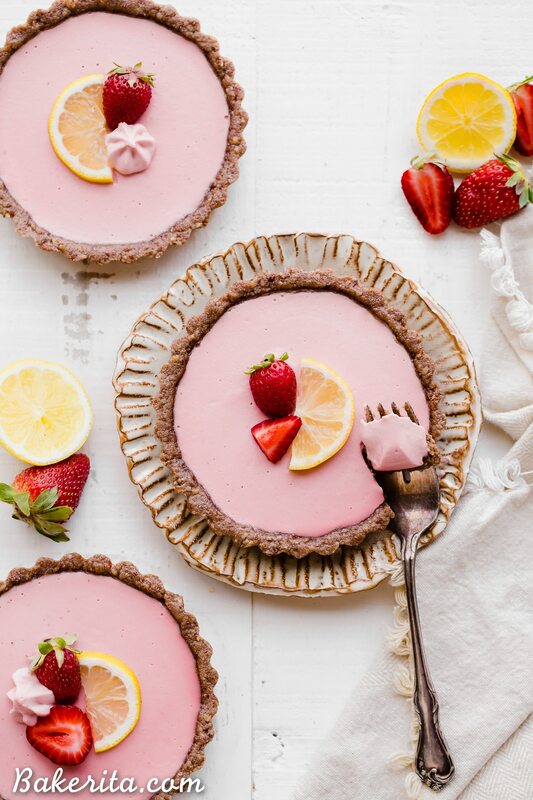 I couldn’t stop sneaking bites from the freezer – so deliciously refreshing, fruity, tart + lemony…it’s summertime heaven. If you’re feeling a little melted yourself, I’d recommend these ;) enjoy, my lovely friends! 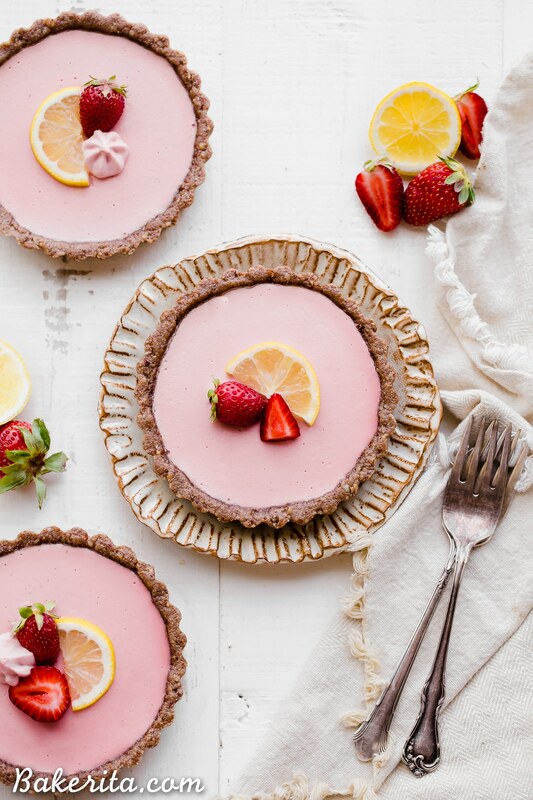 These No Bake Strawberry Lemonade Tarts have a raw "graham cracker" style crust filled with a super refreshing strawberry lemonade filling. These are SO good frozen on a hot day and they're gluten-free, paleo and vegan. Lightly grease an 8-inch tart pan or four 4-inch tart pans with a removable bottom with coconut oil. For the crust, combine the almond flour and pecans in a food processor or high powered blender and pulse to combine and break up the pecans into smaller bits. Add the coconut oil, coconut sugar, and cinnamon and pulse to combine, until it’s fully moistened and sticks together. Press evenly along the bottom and up the sides of your prepared pan/s. Set aside. In the same food processor or blender, combine all of the ingredients in the filling. Turn the food processor or blender on medium-high and blend for about 2 minutes, or until the mixture is silky smooth and creamy. Scrape down the sides as necessary. Pour the filling into the prepared crust or divide between the crusts and smooth the top. Tap hard against the counter a few times to release any bubbles. Place in the freezer for at least 2 hours to set before serving. Serve chilled, and keep any leftovers in the refrigerator (up at a week) or freezer for longer storage.